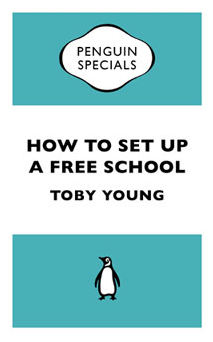 Toby Young the Telegraph journalist who set up the West London Free School who goes by the name of @toadmeister on Twitter has written a book on how to set up a Free School. If you visit the school's webpage you can see a large advertisement for the book on their homepage! I am not quite sure what I think to the Chair of Governors book being advertised in this way but we will overlook that and take a look at the book. The book is a Penguin special and is short and easy to read. It is typical Toby Young style which is engaging and he tells the story of how he set up the West London Free School with lots of advice and tips along the way. Interestingly the book reveals that Toby Young and I could almost have been neighbours! At one stage he seriously considered moving to Suffolk in search of a decent school for his children but decided to stay in London and set up his own instead. Maybe he would have ended up sending his children to the school I am Chair of Governors of. Who knows! I think if Toby had moved to Suffolk though he might be a little less inclined to the view that there is an unlimited capacity for new schools due to a "population explosion". Not here. We have falling rolls in many areas so a new free school might damage another local school no matter how good that school is. But much of the advice is practical and sensible and aimed at allowing local groups rather than large corporate sponsors to open schools which are locally run and managed. If all free schools fitted this criteria then I think he would need a much shorter chapter on dealing with opposition. The chapter on dealing with opposition talks a lot of sense. I wish the free school groups in Suffolk had read and headed his advice. That said it has certainly made opposing them easier because they did not. Toby suggests, rightly, engaging with opponents as soon as possible. What we have seen in Suffolk is a parent group at Ixworth refusing to identify themselves and not allowing people to attend meetings and in Beccles a group that has criticised the Head of a neighbouring school for using Twitter. I am seriously tempted to make a gift of the book to both groups! I don't think Toby is right in assuming all opponents would be the usual suspects who are always opposed to free schools in principal. I accept there are such people but there might also be legitimate objections to the school as well for a whole host of practical reasons. The chapter on IES Breckland is very interesting and revealing. Toby describes how they managed to let a contract to the profit making Swedish IES company. The DfE basically did this as a "pilot" underwriting the costs and risk of the EU procurement exercise. This appears to have been the only way such a contract could be done viably and this was one of the reasons WLFS did not go down this route despite Toby describing a trip to one of the IES schools in Sweden that clearly impressed him. But Toby concludes that he would rather run the school himself and the book is written specifically to enable others to do that. At £2 for the Kindle Download I recommend the book for anyone who wants to set up a free school, oppose a free school or are just curious. You can buy the book at Amazon.